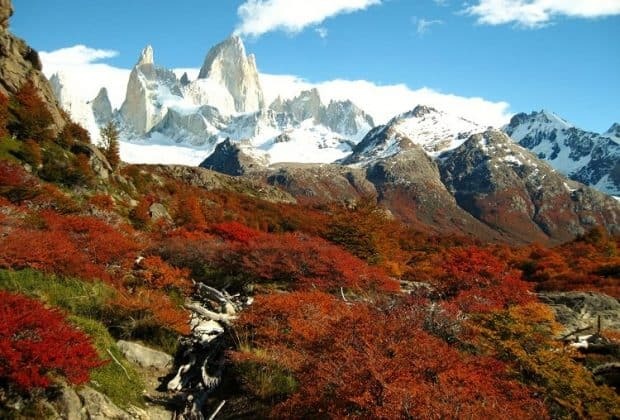 The main reason to come to the little village of El Chalten is hiking. 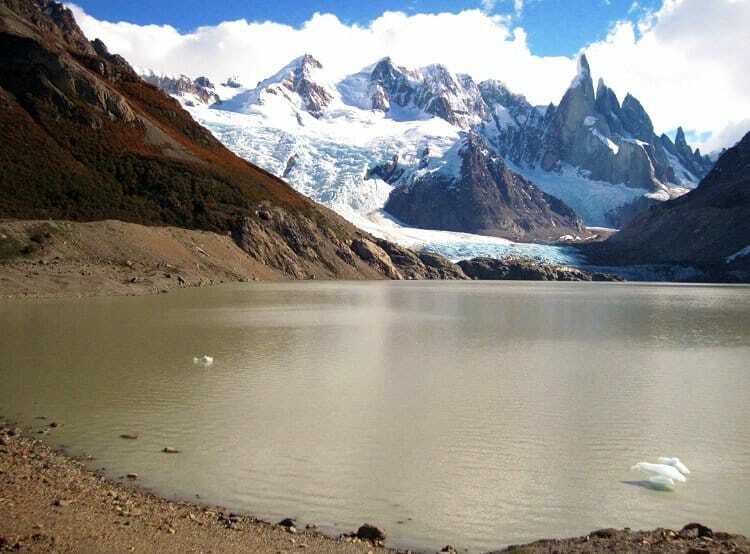 Development has increased since the road from El Calafate is now completely paved, but the town still exists primarily to service visitors to Parque Nacional Los Glaciares. 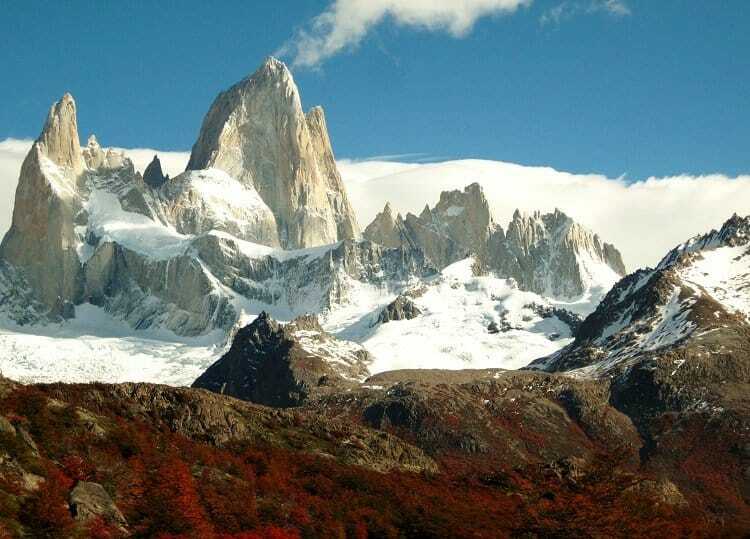 We spent four nights there and did two day hikes, the first along the Fitz Roy trail. We were pleasantly surprised to see the leaves changing. Laguna Capri is the first lake we passed on the track. Like all the trails in El Chalten, this one starts in town. After some initial steep climbing the track became more balanced after about half an hour and we really enjoyed the easy hike to the lookout for Laguna Capri. After the bad weather in Torres del Paine, we were ecstatic to have gorgeous weather for our time in El Chalten. Views of Mt. 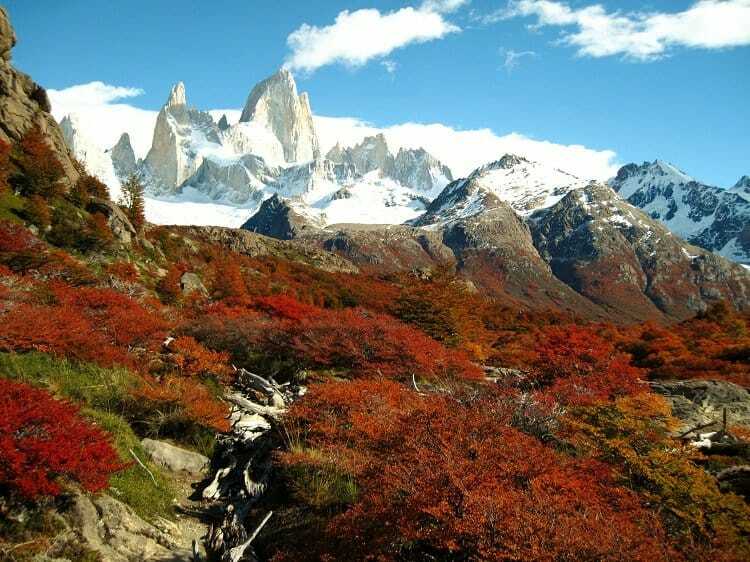 Fitz Roy with the autumn foliage in the foreground. The easy track continued all the way to Poincenot (nine and a half kilometres from town) where we had clear views of the mountain. From this point we had a choice between continuing up the steep, exposed path to Laguna de los Tres or an easier walk to see the glacier at Piedras Blancas. We chose the latter, though given the lack of rain and heavy winds we probably could have handled the more difficult trek. We walked along a small rushing river for about two and a half kilometres before reaching some giant boulders that we had to climb over to reach Laguna Piedras Blancas. I'm realizing this year that I have a bit of a fear of hights. Of course the only way to conquer fears is to do things like climb an active volcano, so with a bit of coaching from John I did make it over and across these boulders to see the lagoon and incredible glacier on the other side. All of the trails in El Chalten are marked in kilometres one-way on the official map so we had to go back the way we came. In total we hiked 24 kilometres and it took us about eight hours to complete the trek. Just before we reached the start of the trail we were rewarded with some wildlife: woodpeckers at work. Check out the little woodpecker in action on the video. We could not believe how powerful their necks are. 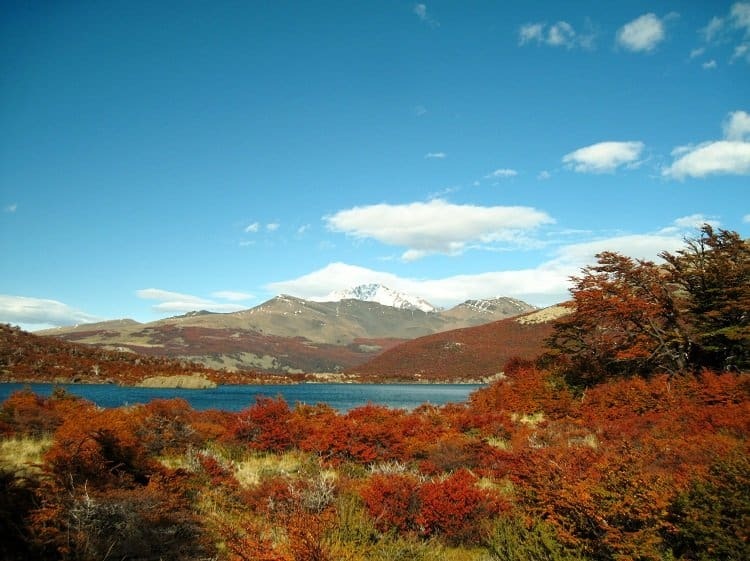 In our next post we'll take you along with us on the Laguna Torre trail so be sure to check back! Getting there: El Chalten is about a three and a half hour bus ride north of El Calafate in Argentina (or two days by bus if coming from Bariloche). An airport services El Calafate. Hi, you have some really nice pictures! Could you tell me what were your travel dates, was this in April or may? The colors in your photos are absolutely incredible! Yay for conquering your fear! I LOVE the video if the woodpecker! Thanks, Lucy! There were actually three of them just working away. So cute! Thanks for the tips. These info will help me to plan a future trip to El Calafate. I think fall will be my first choice os season to go also. The foliage is just amazing! Fall is good but can be rainy – if you’re thinking to include Torres del Paine we were told that November is the best month to go. Oh my goodness. I can’t stop ogling these stunning shots. What a perfectly heavenly spot. All the cares of the world would just slip away with this to linger in.